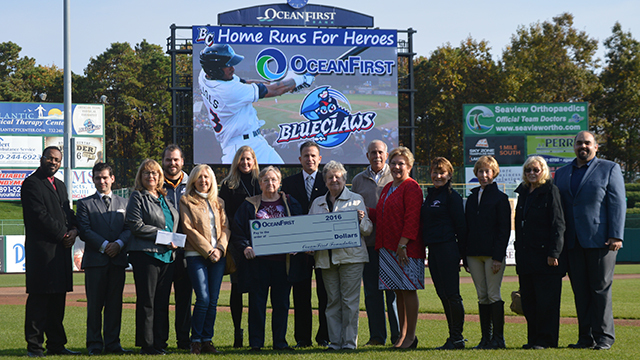 LAKEWOOD, NJ - The BlueClaws and OceanFirst Foundation celebrated another successful season of the Home Runs for Heroes program on Wednesday at FirstEnergy Park as OceanFirst Foundation presented the nine participating organizations with checks totaling $30,000 representing each of the 30 home runs hit at FirstEnergy Park this year. The nine organizations (see below) were each paired with one inning and each BlueClaws home run in one particular inning meant a $1,000 donation to a charity. Among BlueClaws players, Jose Pujols raised the most money. The 20-year old hit 12 home runs at FirstEnergy Park this year, more than any player in BlueClaws history. Jan Hernandez hit five home runs in Lakewood and Jiandido Tromp, who was promoted at the All-Star break, hit four home runs in Lakewood. For more on OceanFirst Foundation, click here.